It’s been 9 months since the last post where I broke down all the issues with the PS4 Media Player. 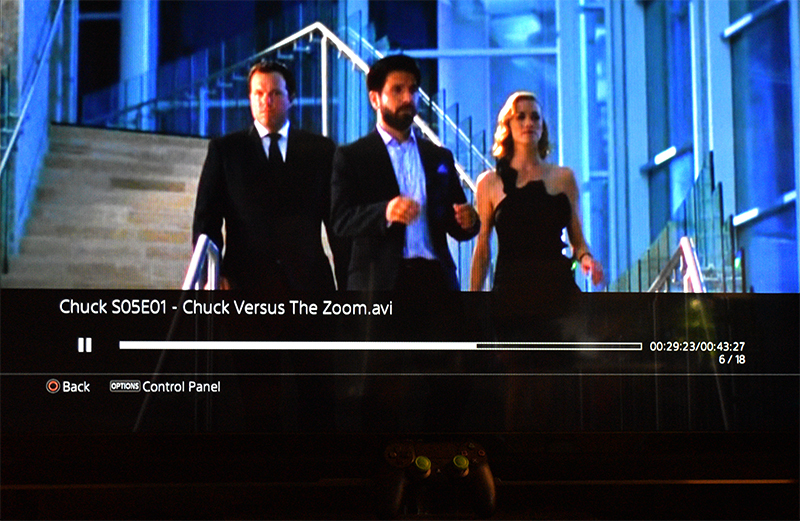 In short, there have been a large amount of improvements to the DLNA functionality. I was forced to use the PS4 DLNA Media Player feature because when my house was struck by lightning last week, it busted my PS3. I think I can fix my PS3 but I haven’t had the time so I’ve been using the PS4 Media Player in the meantime. Once opening up the DLNA Media Player, I was pleasantly surprised to see that Sony had not sat on their hands or twiddled their thumbs, but have actively improved the PS4’s DLNA functionality, which is through their Media Player app. There are still some issues and some things left to be desired, most importantly the blue background, and followed by the lack of a step forward functionality. 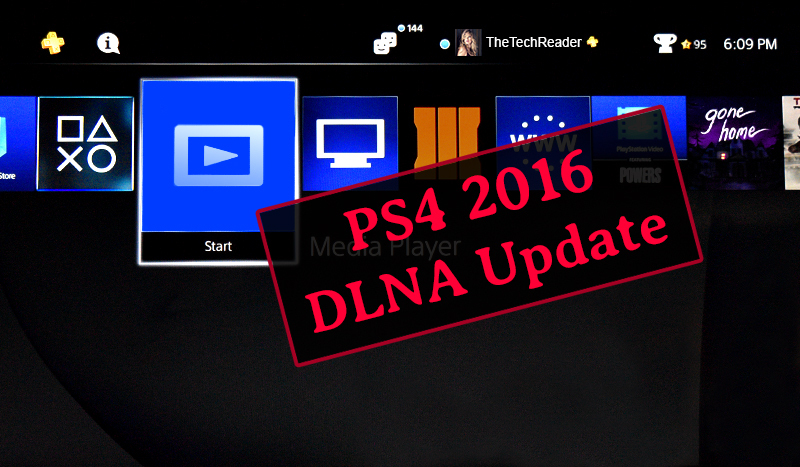 So let’s give you the rundown with the updates that Sony PlayStation has done to their DLNA Media Player based on the problems from the last post. No longer is there a perpetual zoom, and the PS4 Media Player developers have added back in the ability to toggle between three aspect ratios – Zoom, Fit, and Stretch. Fit is the one you probably want to keep it at. 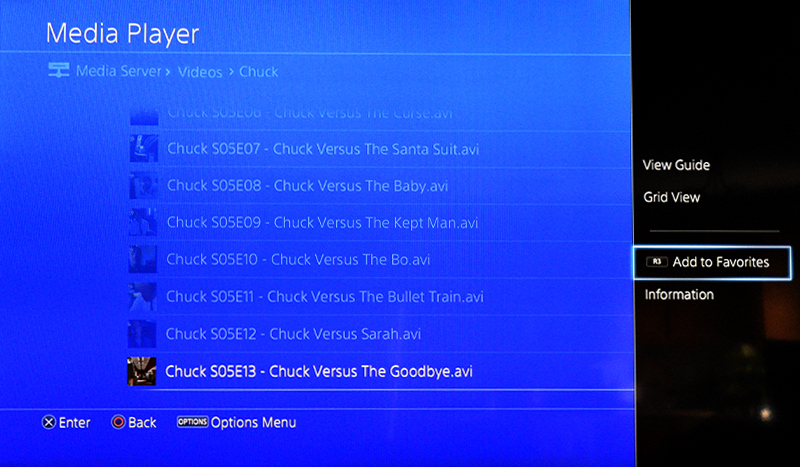 A big problem before was the total lack of in-video options in the PS4 Media Player. Now, however, they have added it in, and by pressing the Options button it will toggle the menu. This is a major improvement and as a result actually makes this DLNA app usable. Kudos to Sony developers for listening! 3 Largely improved video seek ability. It doesn’t have the Scene Search, which I will talk about in the following section; but it does have a new feature which you can easily fast-forward or rewind the video by pressing and holding L2 and R2. This is great for “fast” forwarding, but it is difficult to use for stepping forward. It needs to be improved with the ability to step forward slowly, because I found it really difficult to rewind just a few seconds. I have been trying to tap the L2 button as fast as I can trying to get it to step back just a couple seconds, and this has turned out to be a big hassle. However, something that is really great about this is that in fact it is really improved for fast-forwarding when using transcoding options. 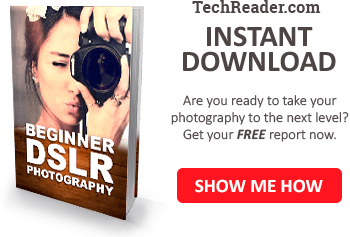 Transcode is what you go to when a video file doesn’t play well using the default option, so you go into the ## Transcode folder and you can choose another video renderer. I have found the usually the best render is FFMPEG when the default Mencoder doesn’t work well for a particular video file, which happens on occasion. In the PS3 DLNA, Transcode was a problem because when you tried to fast-forward or rewind, it would freeze the video for many files that you were trying to transcode, leaving you stuck with the option of choose Scene Select to step forward or back, since fast forward and rewind weren’t working. With the PS4 Media Player, however, this issue is solved, because you can fast forward or rewind perfectly whether you are using the default video encoder or transcode option. This is a greatly improved transcoding functionality and a big improvement over the PS3 functionality in this area. I was actually pretty thrilled to see this option, which I accidentally discovered. Now by pressing R3 (the right thumbstick), it will add a little heart icon in the row of the file you have selected. This is something I really wanted on the PS3, and now the PS4 actually has it. Basically this is useful because say you are watching a series, and sometimes you come back to shows months later to resume. 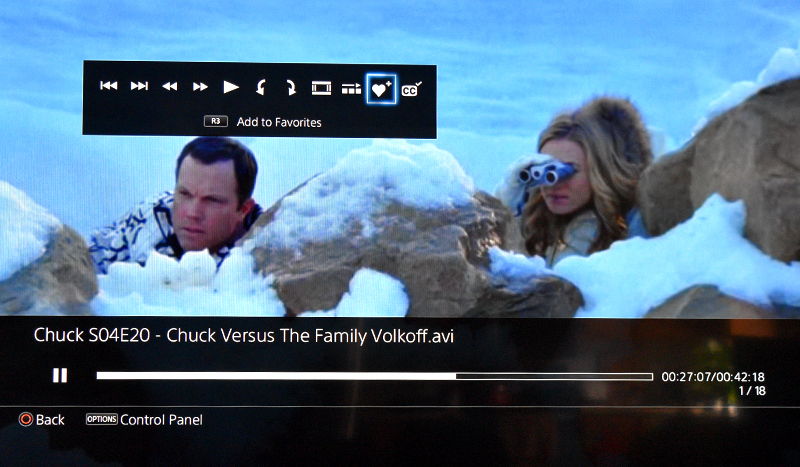 Well now you can just toggle a favorite icon to the last episode you watched, and now you know where you left off! This is a hugely awesome feature. This is a really great feature. Now you can toggle this on, and it will automatically play the next video file that comes after the one you are watching. For example, say you are marathoning a TV series. Now you can be even more lazy and you don’t even need to choose the next episode! It will automatically play the next episode, assuming you have named the files properly so they show up in the media server consecutively. This autoplay is optional, you can toggle it off at any time. The only downside is that it toggles off when you restart the app, so you have to turn it on every time you turn on the system, even from rest mode. 6 Separate app, but pleasantly merged media sources. I would actually call this a big improvement, even over the PS3 DLNA server. Yes it’s a separate app, but at least it opens quickly, although as you’ll see below in the problems list, it has problems finding the DLNA server when you turn it back on from rest mode. Still, what is awesome about the PS4 Media Player is that it merges all the media sources, which includes all the types of files it can play, which are video files and audio files, all in the same place. Contrast this to the PS3 media server, which has a separate section for video files and audio files. With the PS4 DLNA Media Player, now you don’t need to exit out to access music files. I found this very useful because as it turned out I actually started listening to an audiobook on the PS4 Media Player; whereas on the PS3 I never even played any music or listened to audiobooks because I’d have to exit out of videos first and head over to audio files. Now, however, with the PS4 DLNA Media Player, you can visit both video and audio files all in the same place. 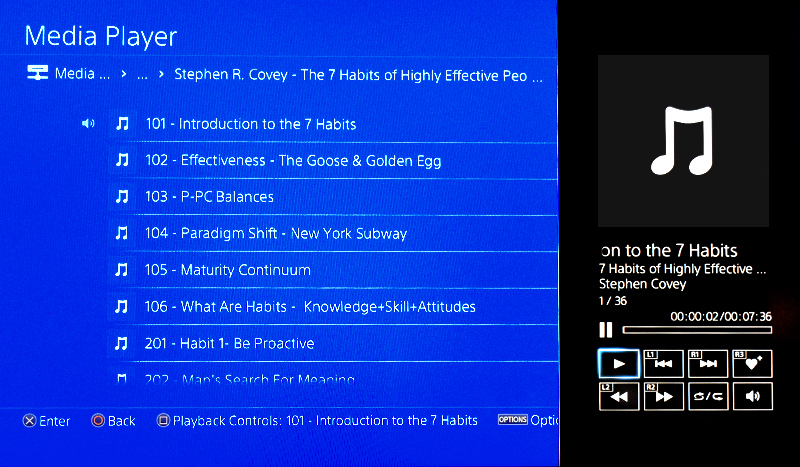 The audio player is drastically improved. 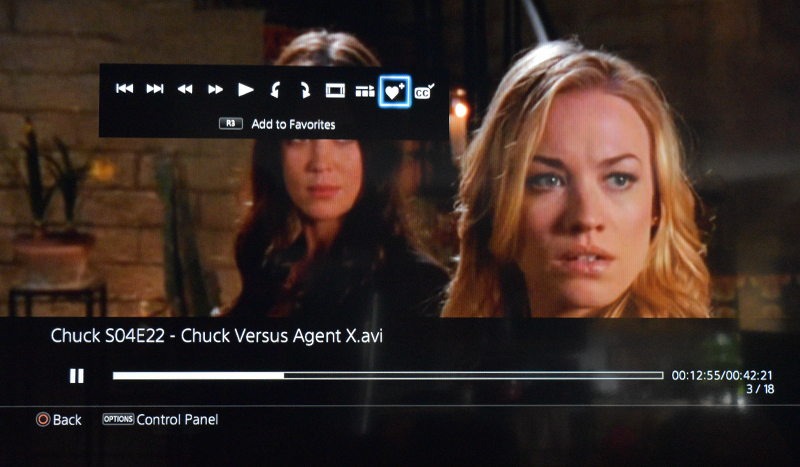 This is a huge positive point of the PS4 DLNA Media Player. There is a dedicated little sidebar which has multiple audio-specific settings, which even includes a loop play where you can loop all, none, or just one on repeat. Wow. Good job Sony! 8 You can listen to audio files outside of the app. Audio files still continue to play when you exit the DLNA Media Player app. It doesn’t work inside some games, however; I tried it on Black Ops 3 and it continued playing the DLNA audio file until the BO3 game loaded the game start menu and then it faded into the game. In the meantime, it paused the audio file, and started where it left off when either pressing the PS button to go to the XMB, or exiting the game. I’m not sure it it works during some games, but if so that would be really cool to listen to your own music during a game, especially since you can put it on album loop or repeat. 1 Still has the blinding Bright Blue screen. If they did no other improvements but this, this is the most important thing for me. If instead of the blinding blue they could make it a black or dark grey screen, this would make the app fully usable. 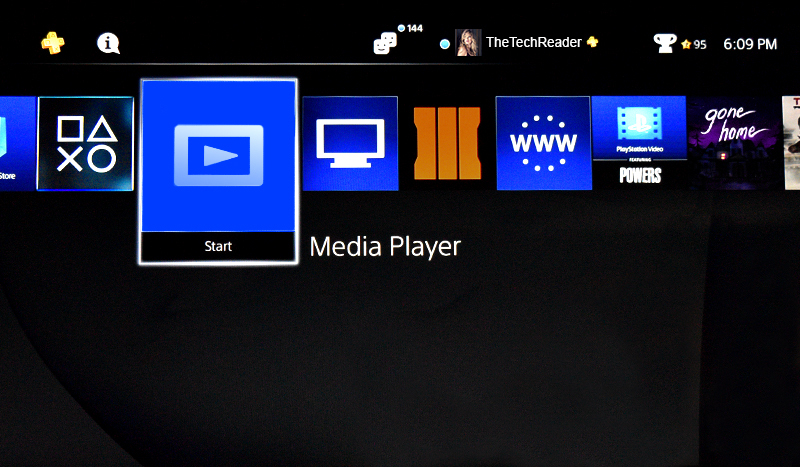 However, as long as there is this blinding blue, I will be going back to my PS3 to use DLNA as soon as I get it fixed. As mentioned before, this is very important because the human body is designed to stop producing serotonin whenever the eyes perceive blue wavelengths of light. As a result, this can really mess up your circadian rhythm. Effectively, what this means is that if you use the PS4 Media Player at night, it is going to play havoc on your sleep cycles literally resulting in you staying up later than you would have, and causing you to have a poorer quality of sleep. 2 Problems seeking DLNA after turning back on. A big problem that is more of an annoyance is that it doesn’t find the DLNA server again after waking from rest mode without you having to manually restart the DLNA server on your computer again. This issue could probably be solved with a “refresh” option, or maybe it is a bug with the program. August 17, 2016 Update: This issue might be fixed now; I use the DLNA server almost every day and since last week it finds it more quickly and within a couple minutes of turning on the system, without having to restart the dlna server on my computer. Now if they will only add a black or grey background instead of the bright blue! January 12, 2017 Update: This issue appears to finally have been solved. Now instead of a couple minutes wait it finds the server almost immediately – within a few seconds. This happened since the most recent PS4 update, and so far the last few days it has been able to find it immediately without having to reset the server. However, there is still no option to “search” for new servers, but it does appear to find new ones right away. The bright blue is still an eyesore however. Literally, it hurts my eyes to look at that bright blue. 3 Still missing some initial video options. 2) if you try to manually rewind to beginning, it doesn’t work properly. In the video, if you try to skip to the beginning with L1, it will sometimes not skip to the beginning but actually start midway through. This is also a problem because you also can’t rewind all the way to the beginning using L2, so you actually have to rewind to almost the beginning because if you go all the way it will skip back to the middle of the video. This is actually a bug with the Media Player and needs to be fixed. If the internet is disconnected, it will terminate the media server even if the router is still on. This means it requires an internet connection in order to work. If you disconnect the internet or if there is an internet outage, after a couple minutes it will say “unable to communicate” or some error and ultimately disconnects you from your media server. January 12, 2017 Update: This is no longer a problem. Now, the DLNA media server works whether or not you are connected to the internet. 5 Still missing some in-video options. It is also still missing several in-video options that are necessary for full functionality. 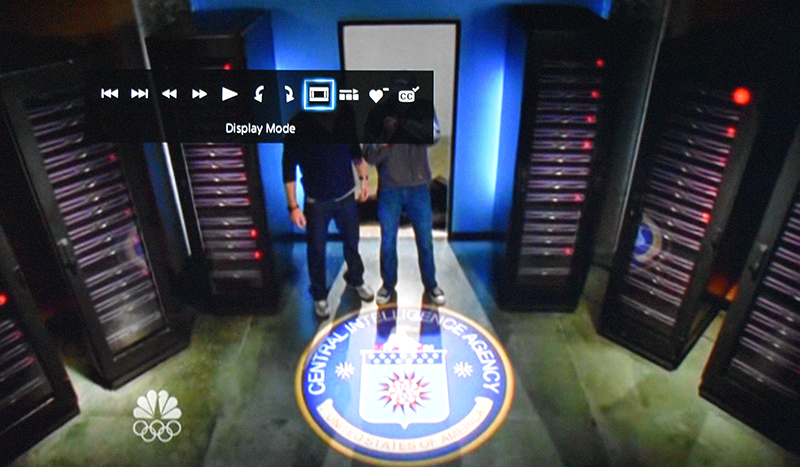 What’s actually interesting though, is that in the PlayStation Store, where you play videos like the Powers show, it uses a different video editor that actually contains Scene Search. What they need to do is also add it into the Media Player. Likewise, the PS4 Media Player does nothing with the right and left sticks. 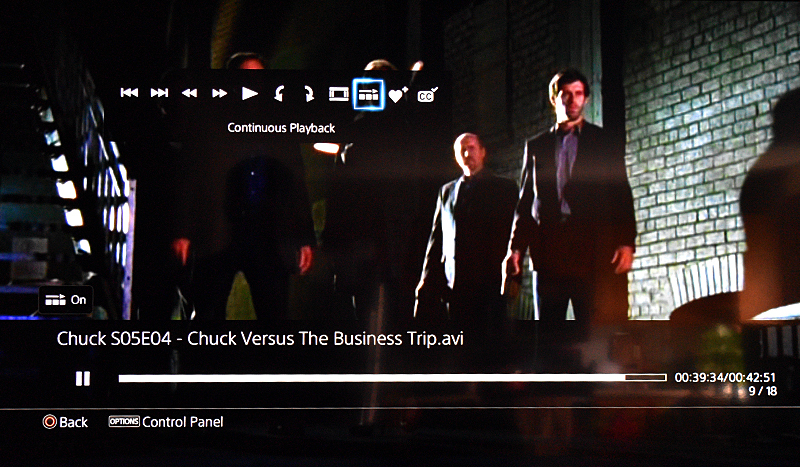 Conversely, the PS3 DLNA functionality will fast forward or rewind videos when you move the sticks left or right. 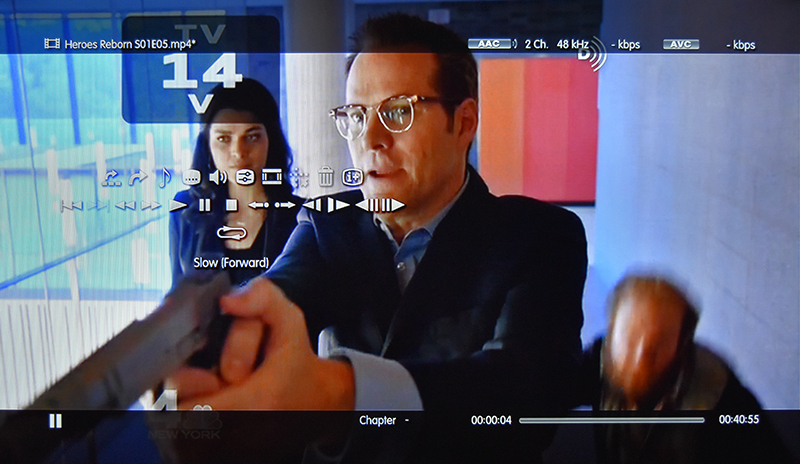 Interestingly, the PS4 PlayStation Store video player also has this ability. They also need to add this ability back into the PS4 Media Player. Unfortunately, for now I can’t provide a side-by-side comparison or any info on whether upscaling is improved, because since my PS3 is still busted, I can’t compare them. However, as far as the side-by-side comparison, check back soon because once I fix my PS3 I will update this post with some comparisons. Another big problem is that you are still unable to reset the video to the beginning. This is a bug. Sometimes, videos will start in the middle, so you need to reset to the beginning. You cannot push rewind to the beginning, if you do it will not go to the beginning but reset back to where you left off. As a result you have to manually rewind to almost the beginning, then try to tap the rewind as lightly as possible a bunch of times hoping it will inch toward the beginning. This is very annoying. The PS3 media server allowed you to press L1 and it would skip to the beginning, but that does not work in the PS4 media server. PS3 media server also allowed you to push the options menu and choose “start from beginning” in case it glitched. 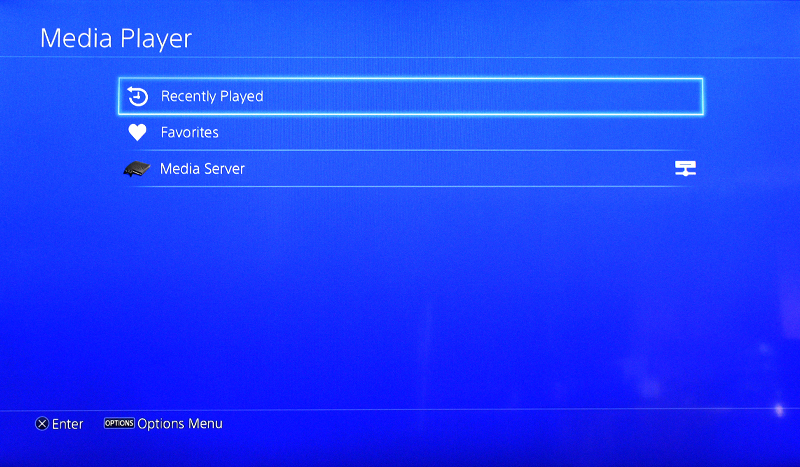 However, PS4 media server does not have this ability, they still have failed to add it. As a result, if you get stuck in a big and as often happens it starts a video in the middle, and you cannot rewind past the middle because 0:00 is stuck in the middle of the video, the only way to watch the whole video is to go into transcoding and choose a different transcoding, or restart the entire media server and reset your PS4. This is a big problem and needs to be solved.